The main protagonist is offered redemption and meaning at several points during his journeys, for instance by the old hippie couple or by Ron Franz (the old man). Franz also advises him about forgiveness. He is also offered love by a teenage girl. Yet, Supertramp constantly refuses the offers, being obsessed about going alone to Alaska. Perhaps this is the conflict "Into the Wild" wants to explore: are we redeemed by social relationships, or can we find meaning alone? Supertramp clearly believes the latter, constantly quoting his beloved Thoreau. However, the end of the story suggests that the real solution is the former: Supertramp is a complete failure in the wilderness, and his last words about having lived a good life obviously refer to his camaraderie with other members of the human race. Yet, his death isn't portrayed as tragic. Rather, he is reunited with his parents and sister in a near-death experience, after first being swallowed and killed by cruel nature. I'm not sure if this is the "true" interpretation of "Into the Wild", but if it is, it suggests that what we're looking for cannot be found in pristine wilderness or splendid isolation from our fellow man. Somehow, I find that a more uplifting message than the crank deep ecology many others see in this film, and which I also saw the first time I watched it. 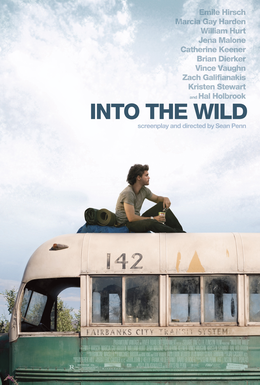 I actually skipped most of "Into the Wild" when Swedish TV was showing it a few years ago, seeing it as yet another Timothy Treadwell story. It's obviously much subtler than that.